The Buffalo Bills defense played well in 2018 with the play of that unit helping the Bills reach the playoffs for the first time since before the turn of the century. As well as they played, there is still much room for improvement and the Bills front office has tried to bring in some players to help achieve that goal. The biggest “get” for the defense was the signing of defensve tackle Star Lotulelei as a free agent. Lotulelei has been a main stay in the Carolina Panther defense for years and of course played under Seam McDermott when McDermott was the defensive coordinator at Carolina. He should do for the Bills defense what he did for Carolina and at 28 years old he still has a number of years left to help the Bills. Next to Star will be veteran Kyle Williams, who keeps on playing well at 34 years of age. The Bills also drafted Stanford defensive tackle Harrison Phillips and the best way to describe him is a younger version of Kyle Williams. When McDermott was in Carolina, his defense played best when he had enough depth on the line to play guys in a rotation. Phillips gives the Bills that depth inside and is capable of playing either defensive tackle position. Adolphus Washington is also capable of playing 15-20 strong snaps a game in a rotational capacity. Free agent signee Tenny Palepoi will also compete for snaps and he could beat out Washington as the fourth defensive tackle. At defensive end, the Bills need to generate more of a pass rush and for that reason, former Washing Redskin Trent Murphy was signed in free agency. Murphy is very productive and plays with a high motor. He’ll start at one end and the other will be either Jerry Hughes or Shaq Lawson. Lawson, who is a former first round draft pick, needs to step up his play as he only has 6.0 sacks in his first two years. There will be as many as four players competing for the fourth defensive end spot on this team with second year man Eddie Yarbrough being the favorite. A player to watch closely in camp is former Giant Owa Odighizuwa who walked away from football last year but is attempting a comeback. He is talented and has excellent natural tools, he just has to play up to those tools. Looking at McDermott’s Carolina defense we saw an undersized but very athletic group across the board. The common denominator of that group was speed and instincts. The Bills didn’t have that last year and even though Preston Brown led the team with 144 total tackles, physically he was not what McDermott was looking for at the Mike position. 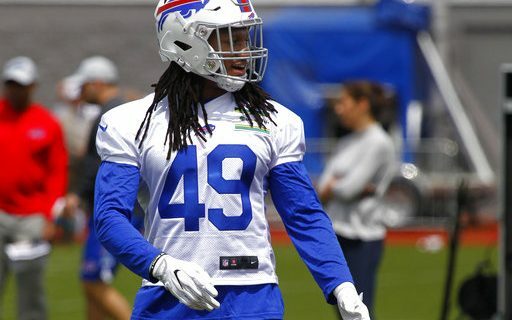 The Bills drafted Tremaine Edmunds to fill the Mike roll and he has the tools the McDermott is looking for. Edmunds just turned 20 years old and he will only keep improving as he gains experience and learns the NFL game. The Will and Sam positions will be manned by two of the group of Matt Milano, Ramon Humber and Lorenzo Alexander. Milano played extremely well as a rookie and should be even better in his second year. He has the instincts and speed that McDermott looks for. Former Jet Julian Stanford was signed in free agency but his role is to be mainly a special teams player but he is also capable of playing in a rotation. The secondary is a strong and accounted for 18 interceptions last year. Gone is corner E.J. Gaines from the group who was lost in free agency. He will be replaced by Vontae Davis who had some strong seasons with the Colts. Davis has more size and can be more physical than Gaines was. Phillip Gaines who was signed in free agency form Kansas City provides the depth. Rookie Taron Johnson form Weber State will also be in the mix for play time. The safeties don’t have the size that some other teams have at the position but both starters have great instincts and ball skills. Jordan Poyer and Micah Hyde complement each other very well and should improve over their strong play form a year ago. All told, the Bills defense is strong. Going into camp it has more overall speed and depth than it had a year ago and that could translate to more wins.